Bill Smith, Editor: It is clear that the left-wing fringe is playing the Race Card in an effort to misdirect the discussion from addressing the facts about programs and issues of a stumbling presidency. The anchors on the president which may be causing the stumbling are the left-wing radicals who wish to control the president and to keep advancing a socialist agenda. The election proved that Americans were more than willing to have a black person as their president. And, a majority of Americans while upset are still waiting for the person they thought they elected to show up as president. It has been most displeasing to see a president acting self-centered, at times arrogant and too full of himself and castigating the general public and his elders. And, anytime the worst president in modern history, Jimmy Carter, speaks on behalf of a current president it is clear that a presidency is in trouble. 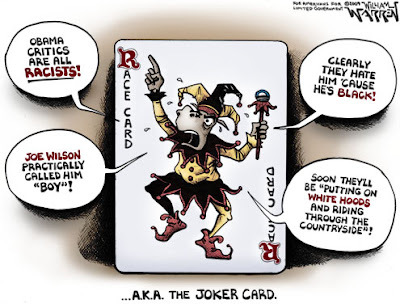 Tags: left-wing, political cartoon, political satire, race card, William Warren To share or post to your site, click on "Post Link". Please mention / link to the ARRA News Service. Thanks! It is backfiring. The right is not deterred, and I'm willing to bet the the middle is being put off by being called racists. I hope they keep it coming. It's working to our advantage. They're making more of a parody of themselves than I ever could. Carter is completely out of touch. I have decided that Jimmy Carter and Barry Carter (Jr.) are the worst Presidents ever because they are such obvious puppets of the shadow left. I guess it's only natural Jimmy would be forced to think that it must be the race thing, because to give any other reason would direct the criticism back upon himself! The only differences between them is color and age, so it just MUST be color, you know? Everyone who disagreed with Carters policies did so because they had "peanut allergies". He's an out of touch, anti-Semitic, washed up, ex-president. Reading about Nashville's new inclusion of 'sexual orientation' and 'gender identity' laws that prohibit discrimination against people based on who they 'think' they are as differentiated from their physical identity, it occurred to me that I have been thinking... 'I am really black.' Now, if there are any reparations paid to black people in the future, I qualify! Also, now that I am black, I cannot be a 'racist'! I don't know what you might be thinking; but, the whole way to overcome this issue of 'racism' may be in everyone 'self-identifying' themselves as 'black.' Now that I am black I feel soooooo liberated... except, because I am a conservative the fact that I am now black is meaningless. Oh, well. I'll keep working on it.